Gift is one of the important ways of transfer of property . So, what are the elements of gift , who can gift to whom, what the legal aspects of gift, how the valid gift is possible, all these legal issues will be described and highlighted on the basis of Transfer Property Act, 1882 and especially sections related to gift of transfer property act. Gift is defined Under Section 122 of Transfer of Property Act, 1882 as the transfer of certain existing moveable and immoveable property made voluntarily and without consideration, by one person called the donor, to another, called the done and accepted by or on behalf of the done. A gift is a transfer of property without any monetary consideration by one person in favour of another and accepted by him or by a person on his behalf. A gift, where both the parties are Muslims is governed by the provisions of Quranic Law, and not by the Transfer of Property Act as it is inconsistent with the provisions of this act. There are certain essentials of a gift like donor and donee, subject matter of a gift, interest created by the donor, gift must be made with free and voluntary consent and acceptance of the gift without consideration. Under Section 122 of Transfer of Property Act, 1882 Gift is defined as the transfer of certain existing moveable and immoveable property made voluntarily and without consideration, by one person called the donor, to another, called the done and accepted by or on behalf of the done. The acceptance of gift must be made during the lifetime of the donor and while he is still capable of giving. If the done dies before the acceptance, the gift is void. corpus during her lifetime and thereby postponed the right of the settlees to enjoy the properties. Therefore, there is no question of Exhibit B-1. becoming ineffective or inoperative on the ground of there being no vesting of title in praesenti on the settlees. Gift is the transfer of certain existing : movable or immovable property made voluntarily and without consideration, by one person, called the donor, to another called the donee, and accepted by or on behalf of the donee. Such acceptance must be made during the lifetime of the donor and while he is still-capable of giving. Sections 122 to 129, coming under Chapter VII. of the Act, under the heading “Of Gifts” deal with various aspects of a gift, viz., regarding the effect of transfer, suspension and revocation of gift, etc. Section 122, which defines a ‘gift’ contemplates the acceptance of the gift by or on behalf of the donee during the lifetime of the donor. Donor and Donee: Parties to the gift are the donor who makes the gift and the done who or whose behalf the gift is accepted. The donor must be a person competent to contract means he/she must be of sound mind and major according to section 11 of Contract Act 1870, and authorized to transfer the property. A person who is not competent to contract cannot gift his property. The done on the other hand can even be a minor.Donee must be an ascertainable person. A public or an unregistered society cannot be a donee. Gift must be made of existing movable or immovable property capable of being transferred. Future property cannot be transferred. The share obtained after partition of the joint family property can be gifted. Even a gift of property that is obtained after a preliminary decree of partition is passed by the court is valid. · Interest created by the Donor: The donor is competent to create either an absolute interest in the property in favour of the donee or even a limited interest. For example – A gifts his immovable property in favour of B and puts a condition that he would enjoy the property exclusively without any body else having any right over it. This interest created here is an absolute interest. However if the gift says that he must enjoy the property only for his lifetime and after his death, the property would revert back to A or his heirs, it would be the creation of a limited estate in favour of B. The offer to make the gift must be voluntary. A gift therefore should be executed with free consent of the donor. This consent should be untainted by force, fraud or undue influence. Mere relationship between the donor and donee is not a conclusive fact of the exercise of undue influence and it must be proved that the transaction is unconscionable. The gift must be accepted by the donee himself. Acceptance can be validly given by a minor donee himself or by his mother or guardian or by an agent is case of a deity. If the guardian gives the acceptance on behalf of the minor the minor on attaining majority can either accept it or reject it. Acceptance must be made during the lifetime of the donor and while he is capable of giving. According to s. 122 if the donee dies before the acceptance of gift the gift is void. The word ‘consideration’ refers to monetary consideration and does not include natural love and affection. If the consideration is a nominal amount of money or the property is grossly undervalued yet the transfer would not be a gift but a sale. In fact, the passing of money as a consideration, howsoever small it may be, would destroy the nature of transfer as a gift. Gifts in lieu of expectation of spiritual and moral benefit or a promise to look after the donor in her old age or through our life are transactions without any consideration. A transfer executed for consideration of a donee undertaking the liability of the donor is not gratuitous, and not a gift. Inter vivos gifts Inter vivos is Latin for “between the living” or “from one living person to another.” A gift inter vivos is one that is perfected and takes effect during the lifetime of the donor and donee and that is irrevocable when made. It is a voluntary transfer of property, at no cost to the donee, during the normal course of the donor’s life. There are a number of special types of inter vivos gifts. Forgiveness of a debt is a gift of the amount of money owed, and delivery can be accomplished by destroying the promissory note signed by the debtor and handing it over to him or her. A share of stock in a corporation may ordinarily be given to someone else by having ownership transferred to the person on the books of the corporation or by having a new stock certificate issued in the person’s name. A life insurance policy can generally be given to someone by delivering the policy, but it is more expedient to express in writing that all interest in the policy is assigned, or transferred, to the donee and to notify the insurance company to that effect. Certain states require these formalities since insurance is strictly regulated by state law. Gifts of land can only be made by written transfer. A donor can limit an inter vivos gift in certain ways. For example, he or she might give someone a life estate in his or her property. When the donee dies, the property reverts to the donor. A donor cannot place other restrictions on a gift if the restrictions would operate to make the gift invalid. If, for example, the donor reserves the power to revoke a gift, there is no gift at all. Causa Mortis Gifts A gift causa mortis (Latin for “in contemplation of approaching death”) is one that is made in anticipation of imminent death. This type of gift takes effect upon the death of the donor from the expected disease or illness. In the event that the donor recovers from the peril, the gift is automatically revoked. Gifts causa mortis only apply to personal property. The requirements of a causa mortis gift are essentially the same as a gift inter vivos. In addition, such a gift must be made with a view toward the donor’s death, the donor must die of the ailment, and there must be a delivery of the gift. 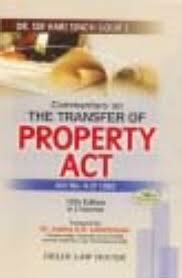 Section 123: Section 123 of Transfer of property act, 1882 deals with transfer how effected. For the purpose of making a gift of immovable property, the transfer must be effected by a registered instrument signed by or on behalf of the donor and attested by at least two witnesses. For the purpose of making a gift of movable property the transfer may be effected either by a registered instrument signed as aforesaid or by delivery. Such delivery may be made in the same way as goods sold may be delivered. Section 122 defines gift to mean the transfer of certain moveable or immoveable property made voluntarily and without consideration by one person to another and accepted by or on behalf of the latter. But how the gift becomes effective is given under Section 123. It is seen that the gift of immoveable property should be made only to transferring the right, title and interest by the donor to the donee by a registered instrument signed by or on behalf of the donor and must be attested by at least two witnesses. In the absence of any registered instrument of gift and acceptance thereof by the donee, the said property could not be said to have been legally transferred and therefore the gift is not complete in the eyes of law. Where immovable property is gifted, the transfer must be effected by a registered instrument signed by or on behalf of the donor, and attested by at least two witnesses. A gift of immovable property is invalid without a registered instrument even if the intended donee is put in possession. An oral gift is void in law unless there is a specific statutory provision dispensing with formalities for gifts as laid in the Act. Registered gift deed — Denial of execution of, by person by whom it purports to have been executed — Burden of proof of execution is on party relying upon deed and burden has to be discharged by calling at least one of attesting witnesses to prove execution — Where burden has not been discharged, deed cannot be used as evidence of gift. Held: Section 123 of the Transfer of Property Act, requires the specific mode in the matter of execution of gift of immoveable property. That gift of immoveable property can be made only by the execution of the registered deed attested by two witnesses. …. The law prescribes the specific mode that it must be effected by a registered instrument or deed signed by or on behalf of the donor and attested by at least two witnesses. Section 68 of the Indian Evidence Act, 1972 required the production of at least one of the attesting witness to prove its execution. Compliance with the provisions of Section 68 or 69 of the Indian Evidence Act is necessary to make gift deed admissible in evidence. …. None of the attesting witnesses of the deed has been examined in this case to prove the execution thereof. The deed dated 29-11-1960 could not be used as evidence and its execution cannot be said to have been proved. — Smt. Flora Margaret v A. Larwence, 2000(6) Kar. LJ. 27B. Transfer of property under — Mode of transfer — Gift deed may provide for transfer of existing property to donee at future date and/or on happening of certain events — Intention of donor to be gathered by reading deed as a whole — No word thereof to be ignored as meaningless — Effect to be given to every part of deed — Where gift deed in favour of two minor donees jointly concludes with words “you shall enjoy property and live as you wish after you have attained majority and got married”, the words to be interpreted that gift would take effect oniy when donees marry on attaining majority — Property not conveyed to donees as marriage between them did not take place. Held: A reading of Section 123 along with Sections 122 and 5 of the Act, it appears to me that in the matter of gift also, transfer or conveyance of the property may be provided to take place in present or in future. The gift deed may also provide that the transfer may be effective on the happening of certain conditions in future. In other words, person making the gift may provide that the interest in gifted property will stand conveyed or transferred as per deed either in present or in future. In the deed, it has to be looked into to ascertain the intention of the parties, whether the transfer has been effected in present or in future, Expression lastly used in the document, “you shall enjoy the above mentioned property and live, as you wish after you attained majority and got married”. These expressions have to be taken as controlled by the expression used earlier that the intention of the author is that the right and title as an absolute owner of the property should pass on to the donees on the fulfilment of those conditions. That as the document appears to have been executed with the object of the marriage and the effect of it is that donees could get absolute ownership under the deed on the fulfilment, of both the conditions, namely, attaining the age of majority by both of them and they getting married and until and unless this had so happened, the property had to remain in possession of the husband of the donor. This action shows that till the happening of the condition, namely, the attaining the age of majority by the two donees and their getting married, the property had to remain in possession of the husband of the donor, so, the property had not been transferred to the donees, the transfer could take effect only on the donees attaining majority and getting married. That as the marriage did not takes place in the present case and the plaintiff did not marry the defendant’s daughter, deed did not become effective to transfer the title of the property to the plaintiff and defendant 1 and the title of the property re-examined with the donor. Mere execution of the deed of cancellation at subsequent stage will not lead to the conclusion that the gift deed had been acted upon. The deed cancelling the gift deed might have been executed as a matter of mere precaution and for safety protection. — Hutchegowda v Smt. Jayamma and Another, 1996(2) Kar, L.J. 751. In the present case, the gift deed in question has been registered and the necessary endorsements are made by the Sub-Registrar. P.W. 2 has sworn that he had attested the deed. But he has nowhere stated in his evidence that the executrix namely, Gangavva affixed her signature or mark to the gift deed in his presence or acknowledged to him, that she had affixed her signature or mark to the gift deed. Therefore, his evidence does not satisfy the ingredients of definition ‘attested’. Hence, it will have to be held that attestation by P.W. 2 and another person as required by law, has not been proved. Therefore, though Gangavva appears to have admitted execution of the gift deed as is seen from the endorsement of the Sub-Registrar, it will have to be held that the gift deed, though registered, does not satisfy the ingredients of Section 123 main part. When that is so, no title in law can be said to have passed from Gangavva to the plaintiffs, even assuming that Gangavva did have such title to transfer. — Anant Somappa Pattar v Kalappa Devendrappa Yarakad, 1987(2) Kar. L.J. Sh. N. 177: ILR 1985 Kar. 1432. Gift – proof of attestation. Where the attestor called as witness says he does not know who else attested and there is no other evidence, held, the gift deed was not proved as required by law. — Kempamma v Honnamma, 1979(1) Kar. LJ. Sh. N. 85. A gift after delivery of possession becomes irrevocable but in order to be valid a gift should be followed by possession and if the gifted property is capable of physical possession non delivery of the property makes a gift invalid. Delivery is not necessary where the donee is a minor and is living with the donor and under his care. The rule applies to Hindus and delivery of possession is essential to the validity of a gift. Although the Hindu Law requires delivery of possession to complete a gift of ‘Immovable property’ that law has been abrogated by section 123 of the act. Since delivery of possession is not necessary, it follows that if a hindu executes a gift in praesenti of three villages by means of a duly registered instrument but reserves possession of the villages in order to enjoy and usufruct during his lifetime and at the same time provides that he would not alienate the property to anybody else the gift is perfectly valid. A transaction by which a Hindu father makes a division of his self – acquires property between his sons does not amount to a gift. Where a deed of gift was duly made registered and accepted the mere fact that the deed of gift remained with donor did not make the gift any the less complete. Declaration of gift by the donor, an acceptance of the gift by the donee, and delivery of possession such as is the subject of the gift susceptible of. A registered instrument is not necessary to validate a gift of immovable property. Under the Mahomedan law a valid gift can be effected by delivery of possession and if there is a delivery of possession the mere fact that there is also an unregistered deed of gift does not make the gift invalid. Delivery of possession being essential to the validity of a gift it follows that if there is no delivery of possession there is no valid gift. Even the registered deed of gift is not effectual under the Mahomedan Law, if it is accompanied by delivery of possession. A gift takes effect from the date of execution of the deed of gift and not from the date of its registration. A gift takes effect as soon as the instrument of gift, is duly executed and attested is handed over to the donee and the gift has been accepted by the donee. A gift of movable or immovable property by a registered instrument is complete as soon as the donee accepts the same. Delivery of possession is not necessary unless it is a case of oral gift under any custom. Section 124 of transfer of property act, 1882 deals with gift of existing and future property. A gift comprising both existing and future property is void as to the latter. A gift must be of existing property. A gift comprising both existing and future property is void as to the latter. A gift cannot be of future property. A gift of a sum not available with the firm or the family or a company which is not a banking company and has no overdraft facility is invalid. Section 124 ofthe Transfer of Property Act, gift of future interest is void under law and, admittedly, on 22.2.69 when the two deeds of gift were executed by Ramadhar Singh, his mother Most. Sawaro Devi was alive and she was the full owner of her half share in the ancestral propertymeaning thereby that on the alleged date of execution of the gift deed Ramadhar Singh had only half share in the ancestral property left by his father and, so, he was not entitled to execute gift deed with respect to the entire ancestralproperty left by his father. At best he could have gifted only half share in the ancestral property and, therefore, the execution of gift by Ramadhar Singh with respect to half share of his mother could not be held to be valid. Section 125 relates to gift to several of whom one does not accept. A gift of a thing to two or more donees of whom one does not accept it is void as to the interest which he would have taken up had he accepted. The rule herein refers to gift made by a donor to two or more persons. As the gift is not valid till it is accepted, accepted by all is necessary if the gift as a whole to be treated as valid. However, if one out of several donees or more does not give the consent the gift does not fail in its entirety and is valid with respect to the shares of those who have accepted it. Section 126 of transfer of property act, 1882 deals when gift may be suspended or revoked. The donor and donee may agree that on the happening of any specified event which does not depend on the will of the donor a gift shall be suspended or revoked but a gift which the parties agree shall be revocable wholly or in part, at the mere will of the donor is void wholly or in part as the case may be. A gift may also be revoked in any of the cases in which if it were a contract it might be rescinded. Such as aforesaid a gift cannot be revoked. Nothing contained in this section shall be deemed to affect the rights of transferees for consideration without notice. Illustration – A gives a field to B, reserving to himself with B’s assent the right to take back the field in case B and his descendants die before A. B dies without descendants in A’s lifetime . A may take back the field. A gift is primarily a contract and if both the parties agree that the gift would be revoked on the happening of an event the happening of which does not depend purely on the wishes of the donor I that event happens, the gift will be revoked. This event may be certain or uncertain. 2) The gift can be revoked in case, if it was a contract it could have been rescinded. A gift may be subject to a condition precedent or a condition subsequent if the condition precedent is impossible or illegal, or immoral the gift fails. A gift may be subject to a condition subsequent and the gift fails and property reverts beck to the donor if the condition is not fulfilled. Section 127 of transfer of property act, 1882 deals with the onerous gifts. Where a gift is in the form of a single transfer to the same person of several things of which one is and the others are not burdened by an obligation, the donee can take nothing by the gift unless he accepts it fully. Where a gift is in the form of two or more separate and independent transfers to the same person of several things, the donee is at liberty to accept one of them and refuse the others although the former may be beneficial and the latter may be onerous. A gift with burden is an onerous gift. If by a single instrument the donor confers in favour of the donee a benefit and a burden the donee has to either accept the gift in totality or reject it in its entirety. He cannot accept only the befit and reject the burden. This principle is based on the maxim qui sentit commodum sentire debetet onus which means that the one who receives an advantage must bear the burden as well. Section 127 throws light on the question of validity of transfer of property by gift to a minor. It recognises minor’s capacity to accept the gift without intervention of guardian, if it is possible, or through him. “127. Onerous gifts Where a gift is in the form of a single transfer to the same person of several things of which one is, and the others are not burdened by an obligation, the donee can take nothing by the gift unless he accepts it fully. The last part of Section 127, underlined above, clearly indicates that a minor donee, who can be said to be in law incompetent to contract under Section 11 of the Contract Act is, however, competent to accept a non onerous gift. Acceptance of an onerous gift, however, cannot bind the minor. If he accepts the gift during his minority of a property burdened with obligation and on attaining majority does not repudiate but retains it, he would be bound by the obligation attached to it. Section 127 clearly recognises the competence of a minor to accept the gift. The provision of law is clear and precedents clarify the position. See the decisions of Judicial Commissioner in the case of Firm of Ganeshdas Bhiwaraj vs.Suryabhan [1917 XIII Nagpur Law Reports 18]; Munni Kunwar vs. Madan Gopal [1916 (XXXVIII) ILR Allahabad 62 at 69]; and Firm of Geneshdas Bhiwaraj vs. Suryabhan [1917 Vol. 39 Indian Cases 46]. The position in law, thus, under the Transfer of Property Act read with the Indian Contract Act is that “the acquisition of property being generally beneficial, a child can take property in any manner whatsoever either under intestacy or by Will or by purchase or gift or other assurance inter vivos, except where it is clearly to his prejudice to do so. A gift inter-vivos to a child cannot be revoked. There is a presumption in favour of the validity of a gift of a parent or a grandparent to a child, if it is complete [ Halsbury’s Laws of England Vol. 5(2) 4th Edn. Paragraphs 642 & 647]. When a gift is made to a child, generally there is presumption of its acceptance because express acceptance in his case is not possible and only an implied acceptance can be excepted. Section 122 (quoted above and underlined) covers the case of a minor donee being a person under legal disability. The section, therefore, employs the expression – ‘accepted by or on behalf of donee’. As we have seen above, Section 127 (quoted above and underlined in its last part) clearly indicates competence of a minor donee to accept the gift, if he is capable of so doing. Such acceptance of a gift can be made by himself or on his behalf by someone else. Section 128 of the transfer of property act, 1882 expalins the concept of universal donee. It states that subject to the provisions of section 127, where a gift consists of the donor’s whole property the donee is personally liable for all the debts due by the donor at the time of the gift to the extent of the property comprised therein. Universal donee is a person who gets the complete property of another under a gift deed. If any portion of the donor’s property whether movable or immovable is excluded from the gift the donee is not a universal donee. This section enacts a principle that if a person who has to pay debts gives his total property to another under a gift deed this donee becomes personally liable to pay the debts of the donor. This liability can extend only to the extent of the property that he receives under the gift but cannot exceed it. Section 129 of the transfer of property act explains the concept of donations mortis causa. Gifts can be executed by a person generally during the prime of their life or in an advance age. It can be executed by a healthy person or by a sick person. Law does not specify any age or health condition for the execution of the gift other than primary competency to contract such as the age of majority or soundness of mind. If a person executes a gift when he has an apprehension of death these gifts are called donations mortis causa. 5) The gift becomes void if the donor recovers from his illness or the donee predeceases him. Finally, it can be said that the transfer of property act, 1882 and its section is a complete code of dealing with gift in Bangladesh. Almost all the legal issues regarding gift are answerable in the Transfer of Property Act. 1882 especially in the sections related to gift. Shukla,S.N. (2002).Transfer of Property Act. (24th ed.). Sarathi,V.P. (2005).Law of Transfer of Property.95th ed.) New Delhi: Eastern Book Company. Khandakar,M.S. (2012).Transfer of Property Act, 1882. Dhaka:Eastern law Publishers. Pathak.H.S.(1990). The Indian Contract Act. (11th ed.). Bombay:N.M.Tripathi Private Limited. The General Clauses Act(3rd ed.).(2007).Dhaka:DLR. Tiwari, H.(2005).Transfer of Property Act. (9th ed.). Faridadbad: Allahabad Law Agency. Nandi, N.(1882).Transfer of Property Act,1882.New Delhi:Diwivedi Law Agency.